There are six titles at Level 1: Fun at School explores sounds you might hear at school - in the playground, in the classroom, at lunch-time and at home-time. Kipper and friends go to school on a snowy day and have lots of fun acting out Goldilocks and the Three Bears. At the Farm explores sounds you might hear on a farm. 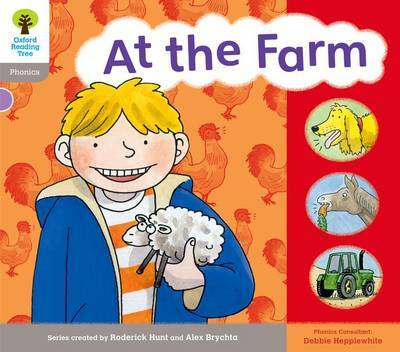 Kipper and his family go on a trip to a farm -they see lots of animals and machines, but they get caught in a storm. Out In Town explores sounds you might hear in the street, at the train station and in a shopping centre. Kipper and Mum go into town to do some shopping and then try to pick up Gran from the train station, but where is she? At the Park explores sounds you might hear at the park and at a fun-fair. Dad takes the children and Floppy to the park on their bikes and scooters, they have a great time, but will he let them go on the fairground rides? At Home explores sounds you might here in your home and in the garden. The children have a great day at home, but Mum and Dad get worn out! At the Match explore sounds you might hear at a big football match and at a party. Will Kipper's team win?